When early Christianity was spreading throughout the lands, itinerant priests and traveling monks used commonly found flowers and trees as teaching aids. This nature language was easily understood, and in fact, was a commonly shared knowledge among all people. These agrarian people based their plant associations on deep inherent knowledge of the plant’s physical properties, its growth habit, appearance, aroma, color and form as well as its more subtle energetic qualities. 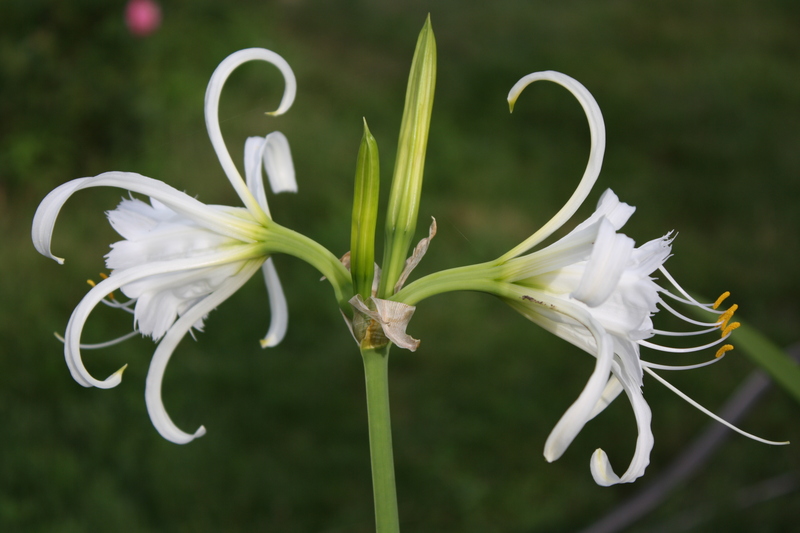 The lily, so soft and feminine yet strong and resilient, became an emblem of Mary, and associated with the Annunciation. 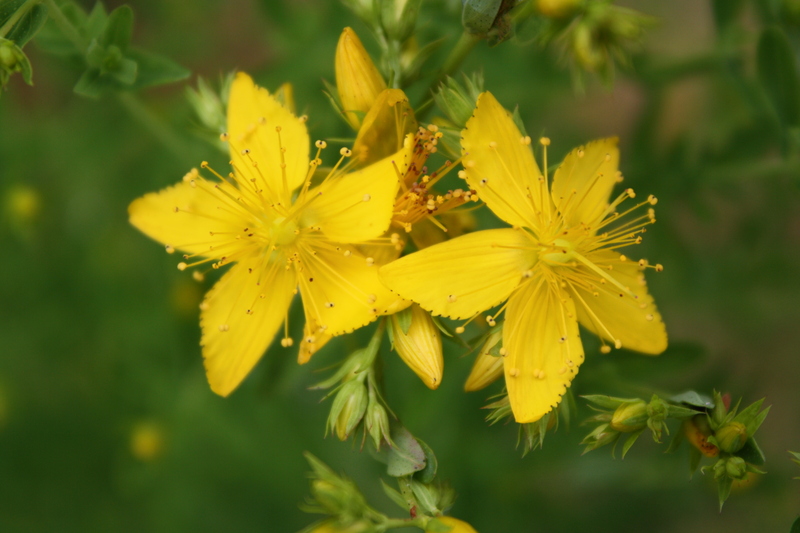 St. John’s wort, well known for its spirit healing and pain easing properties is associated with the Passion of Jesus as well as the heartache of Mary. A deep, reliable knowledge of plants existed, based on generation upon generation of using them and understanding their many gifts, both physical and energetic. This deep body of knowing acquired over many thousands of years, about nature and specifically about plants, was nearly lost during the several hundreds of years around the Protestant Reformation. The Inquisition – After purging Europe of most of the religious heretics, most notably the Cathars, the Inquisition turned its attention to “witches.” During these times many people, especially women wise in the ways of healing with herbs and understanding the language of nature, faced the danger of being labeled as witches. A lot of misinformation exists about this period of European history, sometimes referred to as the Burning Times. According to differing accounts, anywhere from 50,000 to as many as 9 million people, mostly women, were executed during these several hundred years. But a flood of new information on this period has been brought to light, and much of it casts serious doubt on many of the commonly held ideas about who, how many and by what means people were actually killed for being witches during this time. To the early Christian mind, mares, strigae and lamiae (night spirits) were unsophisticated Pagan superstitions. In the early days of Christianity, the Church officially urged all Christian kings to forbid their subjects from killing women accused of being mares or witches. 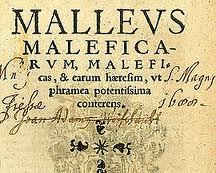 The laws of the Pactus Alamannorum (613-623) created penalties for people who hung or harmed witches. The Edict of Rothari, dated 643, proclaimed it un-Christian to accuse women of such things. These laws suggest that as Christianity spread through Europe, witch hunting declined. The Catholic Church tried most witches during the Middle Ages, and penalties were actually fairly mild. The Inquisition’s job was to reconcile heretics, to bring them back into the Church. The records show that an accused witch, willing to acknowledge the error of her ways, was treated with considerable leniency by the Inquisitors. Few witches actually died during this period. The worst persecutions occurred in central Europe from 1550 – 1650, during the Protestant Reformation, one of the worst periods of religious warfare Europe ever experienced. During the 16th century the rate of persecution and death skyrocketed. The witch trials dramatically decreased during the last half of the 17th century until they virtually disappeared by the end of the 18th century. The truth is that less than 20,000 executions are recorded in Europe. As modern day historians studied the records of trial verdicts, they learned that previous estimates of the European death toll had been greatly exaggerated. Scholars are now confident that somewhere between 20,000 and 60,000 witches died during these times. In his meticulously researched study, Night Battles, Carlo Ginzburg demonstrated that most Italian witches were indeed drawing on pre-Christian traditions and, like the Good Walkers he describes, combined both Christian and ancient shamanic beliefs which were tied to prehistoric agrarian practices. Many of these practices are still in use today. Women made up approximately 80% of those accused of witchcraft, though this varied dramatically depending on time and place. Some northern countries put as many men as women to death, perhaps even more. In Iceland, for instance, 95% of those killed were men. But overall, far more women than men were executed, sometimes as many as 20 women for every one man. Most of those accused as witches were poor. But in some places, especially where the witch hunter could confiscate his victim’s property, accused witches are found among the wealthy as well. A significant number of those accused were herbalists, healers and midwives. Jenny Gibbons, a scholar and historian of Medieval times and the Christian conversion of Western Europe, writes extensively on this period of history. She says that as many as one-quarter of those accused possessed knowledge of herbs and healing, or used some form of healing magic. Elderly people, unmarried, independent women and widows were assailed most frequently. European people of the time believed they were threatened by a Satanic conspiracy. Since Satan was believed to grant his followers both magical powers and great knowledge, midwives, prophets, healers, scholars and even artists could be accused of being witches. Fear of the curative powers that herbalists, healers and midwives possessed caused these skills to be demonized. Satan was the father of heresy and encouraged all evils, especially sexual ones, so homosexuals, sexually independent and especially beautiful women and criminals all fell under suspicion. And, since all ugliness was also the work of Satan, the elderly and the physically or mentally handicapped were also suspect. Although it is hard to believe, Gibbons explains that all segments of European society supported the witch trials. Beginning in 1022, the Church began executing those it considered heretics, people who disagreed with the core of its teachings. When the Burning Times began, Europeans had already become accustomed to burning heretics and religious dissidents. The Catholic Church actually killed very few witches. Most of the religious courts imposed non-lethal penalties, like penance or imprisonment. However, the Church did encourage the intolerance and stereotyping that caused the trials, and its practice of murdering dissidents laid the groundwork for executing witches. The Inquisition played a crucial role in the persecutions by diabolizing witchcraft. But the truth is that contrary to what we’ve all heard, the Inquisition did not kill many witches. They investigated charges of witchcraft from 1300 to 1500, a time when the death rate was very low. After the Reformation, the Inquisition was quietly fazed out of most European countries. When the witch crazes swept Europe, the Inquisition existed in only two countries, Spain andItaly, both of which had exceedingly small death tolls. In fact the Spanish Inquisition killed less than 1% of those accused. In northern Italy several hundred witches were put to death, but in southern Italy there was not a single life lost. After eradicating the Cathars from France, the Inquisitors turned their attention to witches. They re-defined witchcraft as a heresy; it was no longer perceived as a harmless superstition requiring no punishment. Heretics were killed. The Malleus Maleficarum – The earliest witch hunting manuals were written by inquisitors Bernard Gui, Johannes Nider and Heinrich Kramer. Kramer authored the Malleus Maleficarum with some help from a Dominican scholar, and this book, as well as other witch hunting manuscripts, helped to spread the fear of witchcraft throughout Europe. The Malleus Maleficarum has been held up as proof of the Catholic Church’s lust for the murder of witches during 500 years of European history. But, according to Gibbons’ extensive research, this was absolutely not the case. Heinrich Kramer, also known as Henry Institoris, was a German Inquisitor of the late 15th century. He was not well respected and his views on witchcraft were considered both weird and extreme by most of his peers, who continually opposed and hindered his trials. Kramer conducted a large trial inInnsbruckin 1485, where 57 people were investigated. No one was convicted. The bishop ofInnsbruckwas so disturbed by Kramer’s focus on the sexual behavior of the accused women that he closed down the trial, remarking that Satan was in the inquisitor, not the witches. The Malleus is usually circulated along with the papal bull “Summis Desiderantes,” which rants against witches and those who oppose Kramer and his co-author, Jacob Sprenger. But Pope Innocent had not read the Malleus when he wrote Summis Desiderantes. The Malleus was also accompanied by a supposed recommendation from the Faculty of Cologne, the Inquisition’s top theologians. Both these endorsements are misleading. Kramer had complained to the Pope about the poor reception he was receiving from other priests, and the Pope, who greatly feared witchcraft, tried to help by giving him the Papal bull. Pope Innocent also asked a Dominican scholar, Jacob Sprenger, to help Kramer write the Malleus. When the writing was completed, Sprenger presented the Malleus to the Faculty atCologne, asking for its approval. Instead, the Inquisition resoundingly condemned the book. The Inquisitors publically stated that the procedures the book recommended were unethical and illegal, and that its demonology was totally inconsistent with Catholic doctrine. Unconcerned, Kramer forged an enthusiastic endorsement. The Faculty quickly discovered this and was enraged. Kramer and Sprenger parted on bad terms, and the Inquisition condemned Kramer in 1490, just four years after the Malleus was published. It was not the Catholic Church, but actually the secular governments who did most of the killing during these times. In fact, it was the fortunate witch who was tried by the Church. The death toll was always lowest when and where the Church ran the trials, and their courts usually killed less than 1% of the people they tried. The truly damned were tried by the secular courts. They tried far more witches than the religious courts did; the records show that most of the great witch crazes and trials were carried out by secular officials. These local, secular tribunals were often no more than slaughterhouses and as many as 90% of those tried by these courts were killed. Documents show that most of the intellectuals of the time not only accepted, but openly supported the persecutions. In fact, after the 15th century, witch hunting manuals were being written by secular intellectuals. These manuals, and vivid descriptions of the trials, were among the earliest and by far the most popular books printed in England. Peasants were also active participants in the trials. They initiated most of the trials and were usually the main witnesses against the accused. Lynching and vigilantism were common and suspected witches were often brutalized; to break a supposed curse, people slashed an alleged witch’s face with a knife. They murdered witches’ familiars, threw rocks at their homes and held their heads underwater until they promised to remove a hex. And when a professional healer couldn’t cure a disease, he or she often blamed the sickness on a witch. Because of the intense fear of witches and all things pagan, folk wisdom and shamanic practices associated with plants, healing and nature became suspect. This great body of knowledge, the wisdom accrued over millennia regarding the healing properties of the wondrous earth and of the herbs, flowers and trees was forced underground. It went under the surface, hidden in plain sight, and for the most part forgotten. But this knowledge was not, nor could it ever be, entirely lost. This is the wisdom of our cells, formed over eons of co-evolution with all the other life forms on our earth. This is the wisdom of life itself living within us. We can trust it. We need only remember. Deep meditation with the plants is one way to do this. There are many others. For insight into this period of history and the dynamics of the witch trials, I highly recommend the play Saint Joan of Arc by George Bernard Shaw. 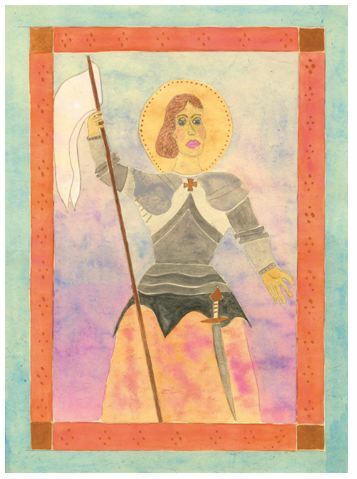 Saint Joan of Arc Though quite accomplished at feminine skills such as sewing and embroidery, Joan of Arc preferred the life of a soldier. Passionate that France not be lost to the English, Joan donned masculine attire and convinced the King to let her lead the battle in defense of France. A heroine when good fortune led to success for the French forces, Joan lost the good will of her supporters when she fell in battle. She was burned at the stake as a heretic and fifty years later was proclaimed a saint. Fascinating…as always. There are so very many opinions about this subject; I doubt we’ll ever know the entire truth of the matter. I adore this article. Thank you for sharing. My husband and I had a past life regression done several months ago and it was revealed that I was an herbalist / witch during the 1600’s and my husband died protecting me from those who were coming to persecute me. I have been intrigued ever since.